Powers/Abilities: In his youth, Tom Harper was a highly skilled hand-to-hand combatant with the agility, strength, endurance and reaction time of an Olympic-level athlete. As the Guardian Angel, he wielded the "Badge of Honor," a durable golden shield shaped like a police badge adorned with a wing insignia. 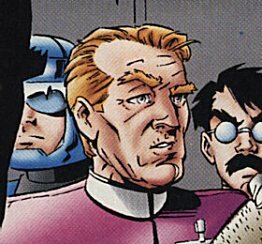 Since retiring from super heroics, the elderly Tom Harper has avoided physical altercations and prefers to battle injustice by using his vast fortune to fund Project Cadmus. 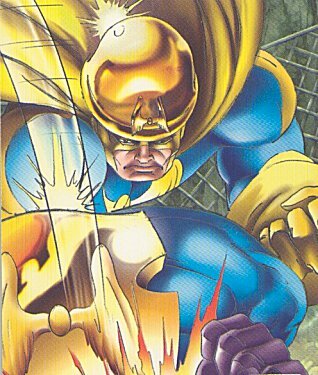 (World's Greatest Comics) - Inspired by the exploits of Super-Soldier (Clark Kent) during the 1940s, billionaire Tom Harper underwent intense physical training and became the homefront hero of World War II, the Guardian Angel. Years after World War II, Tom Harper decided to leave the swashbuckling to the younger generation of heroes. Retiring his winged shield, Harper used his vast fortune to fund Project Cadmus, a scientific think tank dedicated to creating a better, safer world through cutting-edge science. (Spider-Boy #1 (bts)) - As Director of Project Cadmus, Tom Harper made it the project's mission to re-create Super-Soldier (who was thought to have been killed in a battle with the Nazi robot Ultra-Metallo in the final days of World War II). Along with Project Cadmus scientists Victor Von Doom, Reed "Prof" Richards, Dabney Donovan, Otto Octavius, college intern Peter Parker, and General "Thunderbolt" Ross (who was the last surviving member of the original Super-Soldier experiment of the 1940s), Tom Harper attempted to create a Super-Soldier clone with the genetic ability to manipulate gravity. But the experiment was secretly sabotaged by Dabney Donovan (although it was Peter Parker's inexperience that was blamed) and the clone was released prematurely. The teenaged clone, who was thought to be "more spider than boy," became the hero known as Spider-Boy (Pete Ross). (Spider Boy #1) - "Big Trouble!" - After Reed "Prof" Richards (who was at the time under the influence of the "evil DNA" that Doctor Dabney Donovan secretly added to his diet) set the homicidal D.N.Alien known as Bizarnage free from his holding cell in Project Cadmus, the murderous symbiote began running amok through Cadmus' genetic research facilities. 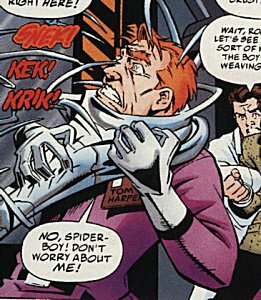 The Bizarnage symbiote attempted to graft itself onto Director Tom Harper so that it could become the "big boss" of Project Cadmus. Although Tom Harper told Spider-Boy not to worry about him, Spider-Boy nonetheless saved the day by tricking Bizarnage into setting Harper free. After Bizarnage was captured, Tom Harper defended Doctor Dabney Donovan from Ben "Rocky" Grimm's accusations that it was Donovan responsible for Bizarnage's escape.